In the year 326 B.C. a play 'Agen' was staged in the military camp of Alexander the Great on the bank of river Jhelum in Upper Punjab. A fragment of a vase, with the painting depicting a scene from the play 'Antigone'. An amphitheatre which betrays Greco-Roman influence was excavated at Nagarjunakonda in Andhra Pradesh. A papyrus manuscript of a farce written in Greek and Kannada languages was found in Egypt in the year 1899 by the team of archaeologists deployed by the Biblical Archaeological Association. 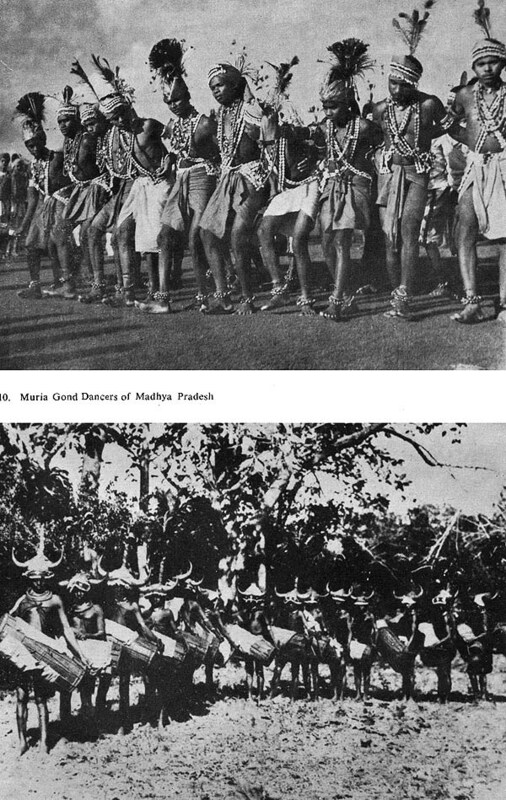 Early Greek records speak of export of flute girls and singing boys to India. 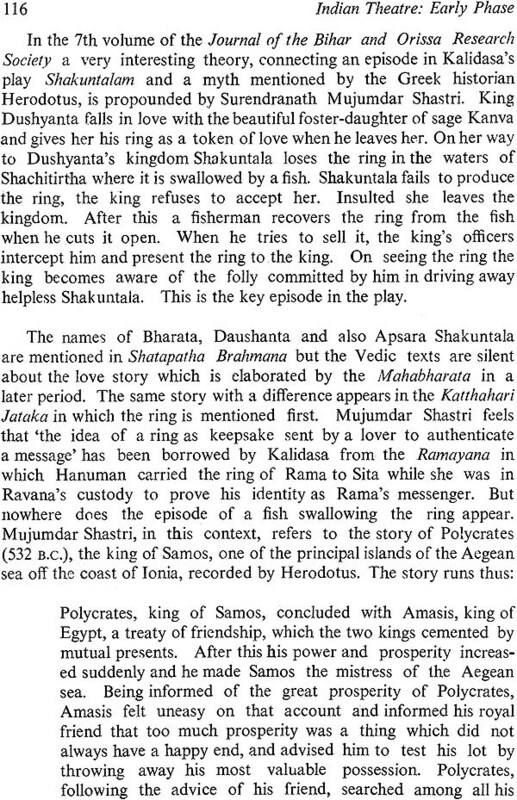 A Sanskrit farce of Gupta period mentions a Yavana Ganika Karpoorturishtha settled in Ujjayani in central India. 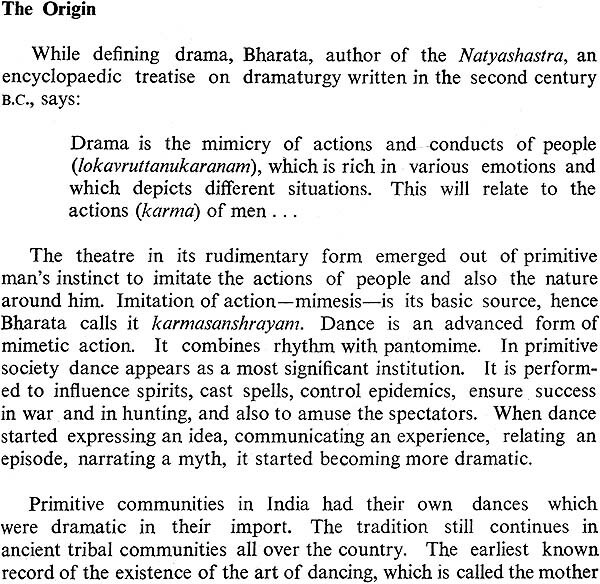 Striking similarities are found in the theories of Aristotle and Bharata about the origin and nature of dramatic arts. 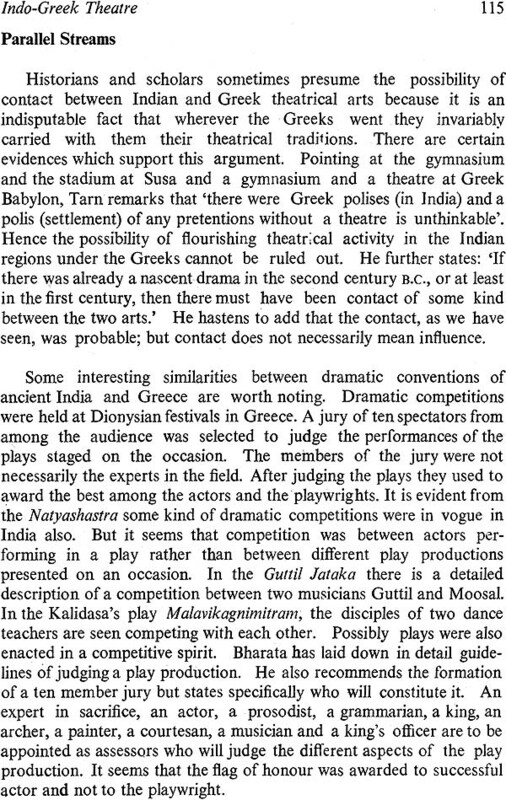 In this book M. L. Varadpande, a distinguished scholar and theatre historian, analyses the data to explore the probable relationship between theatrical arts of ancient India and Greece. 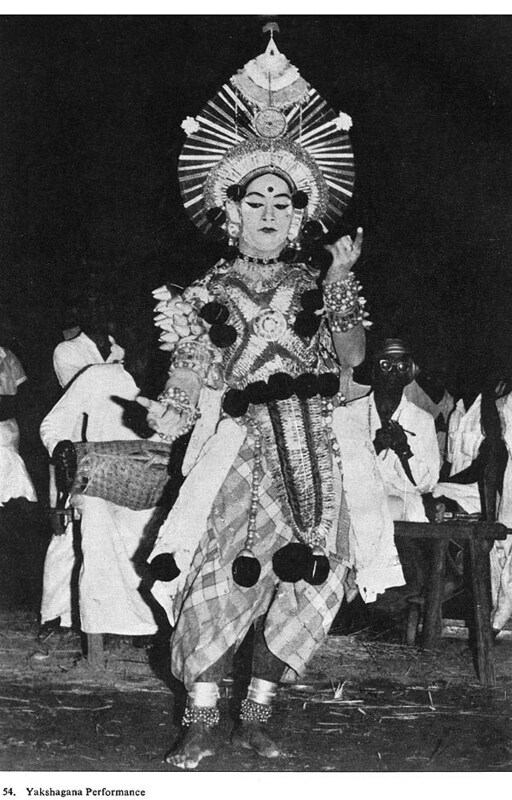 He starts this fascinating study by giving historical account of early Indian theatre. 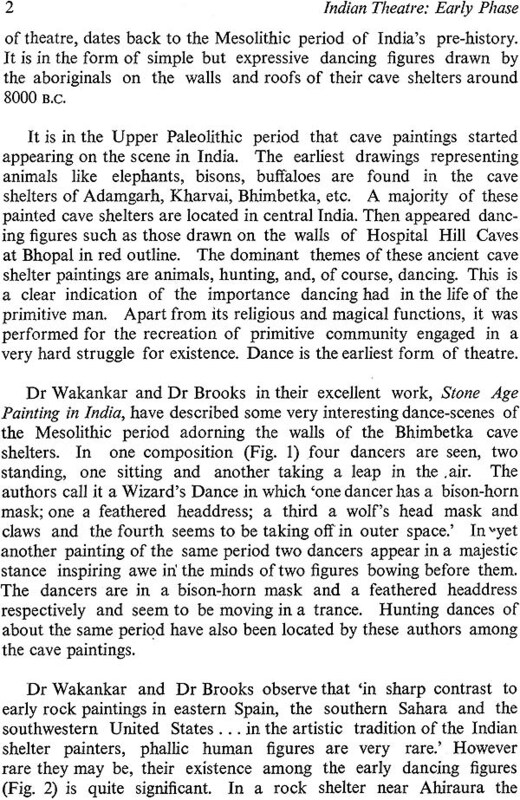 He studies dancing figures on the walls of Mesolithic cave shelters of Bhimbetka, musical instruments and figurines of dancers and jesters excavated at the sites connected with ancient Indus valley civilisation and Vedic rituals, dialogue hymns. 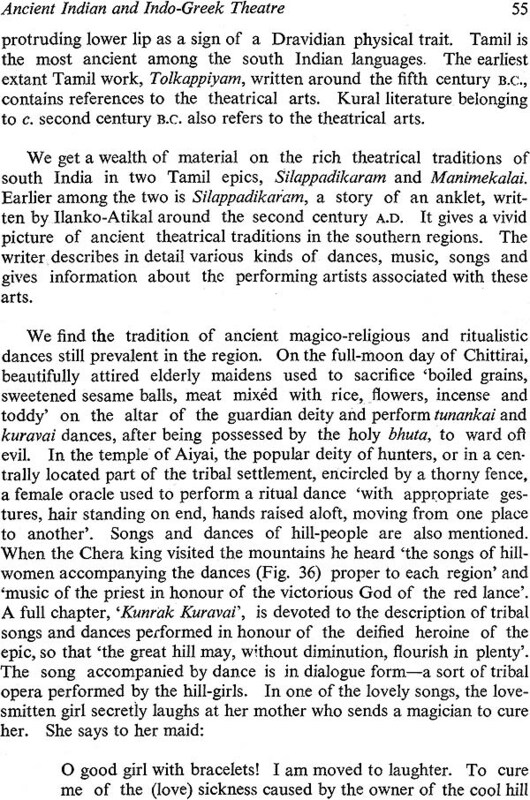 Here is a brilliant work which focuses attention on the unexplored areas of Indian theatrical tradition and speaks about the contact between theatrical arts of two great ancient civilisations of the world. As a serious student of Indian art, literature and culture Shri M. L. Varadpande's contribution to Indological studies is quite significant. He is a scholar with a rare capacity to see historical facts in new perspective and offer original interpretation. Born in 1936 he is an M. A. of the Nagpur University. For many years past he is associated with Alochana, a journal devoted to art and literature, as its associate editor. One of his books has been published by India's National Akademi of Letters-Sahitya Akademi. It is now being translated into various Indian languages. His well known works are 'Traditions of Indian Theatre', 'Krishna Theatre in India', 'The Critique of Indian Theatre' (Edited), 'Ras Opera of Vraj'. He has widely travelled across the country with the view to reach original source material and study different forms of traditional theatre in their own settings. He has been awarded a research fellowship by the Indian Council of Historical Research to work on the project 'TEMPLE THEATRE IN INDIA'.